You will need: Pencil, penknife, hammer, ruler, string 10 inches long, cork, two forks, wooden matchstick, thread. SCIENCE EXPERIMENTS & AMUSEMENTS FOR CHILDREN BY CHARLES VIVIAN. Simple Technical Steped Practical Projects for school and college students. You will need: Pencil, penknife, hammer, ruler, string 10 inches long, cork, two forks, wooden matchstick, thread. In a previous experiment we discovered how to find the center of gravity on an irregularly shaped piece of card, and also proved that once we have the center of gravity of an object it becomes easy to balance it. Some spectacular balancing feats can be performed by making the center of gravity of an object (or group of objects) much lower than usual. Take a pencil and penknife for your first experiment. Open the penknife halfway and stick the point of the blade into the side of the pencil, leaving room for your ringer to support the pencil point, as shown in the picture. With a little manipulation of the half-opened penknife you will find it possible to balance the pencil on a number of other objects. For the next part of this experiment take the hammer, ruler, and string. Tie the ends of the string together to form a simple loop and slip this over the ruler and the handle of the hammer. Position the hammer and ruler, as shown in the second picture, and you will astonish your friends by balancing the ruler with its very tip on the edge of a table. The third experiment is just as spectacular. Cut a V-shaped notch in the end of a matchstick and insert the other end of the matchstick into the bottom of a cork. Now push two forks into the sides of the cork. Make sure that the forks are firmly in position and then place the notched end of the matchstick on a length of thread. 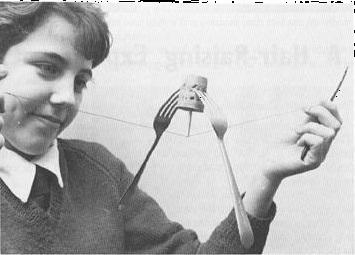 The contraption will balance perfectly, and if you hold the stretched thread at an angle, the whole contraption can be made to glide down the thread without losing its balance.